I descended with the ship, keenly aware of the environment around me. Bugs skittered down the walls and I felt like I was actually there. I know, at this point talking about things like presence and immersion are buzzwords for VR that you’re sick of hearing, but seriously, there was some presence and immersion to the moment. Yet, in Star Child, that sense of immersion doesn’t come from feeling like you are there yourself, but like you are looking into a fascinating world in front of you. 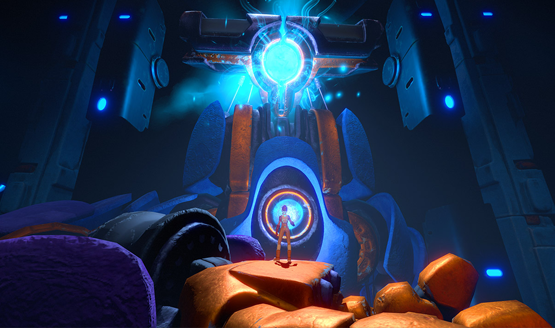 Star Child is playable on a flat screen, but VR puts the environment in front of you like a living diorama. That godlike feeling is something I’ve always loved about VR. It’s the exact opposite end of the spectrum as seeing the enormity of the world around you. Instead of feeling extremely small, you feel more in control of the world and environment than ever before, able to examine everything. It works very well for third-person platforming games, and can even have a thrilling effect in a two dimensional sidescroller, which Star Child is. It’s a traditional 2.5D game, yet there’s now a sense of immersion as I lean into what would traditionally be the boundaries of the screen. Some enormous creatures can still be frightening in VR. That’s not to say that just because I lord over the diorama of Star Child’s world that there’s not a sense of scale and enormity. The massive spider-like creature that chases my main character along her path is terrifying. The huge robot that saves her at the end invokes the same kind of fearful wonder as something like the Iron Giant. Somehow, Star Child has a duality of making you feel like a massive god over this world, but making you feel incredibly small and helpless at the same time, and I can’t imagine that feeling would persist outside of VR. Gameplay is as simple as one might expect from a sidescrolling platformer. Much like Limbo or Inside, the pace of the character is a little slower. From the demo I played, this isn’t a metroidvania style of game (though wouldn’t that be a great idea for a VR title?). Who knows though, maybe the game evolves into that complexity at a later stage? There were some small puzzles along the way in my demo, but they were simple to figure out and overcome. It feels like this demonstration is more of a proof of concept for how a sidescrolling game might work on a VR platform as opposed to showcasing the kinds of challenges that might await further in. What struck me was the visual presentation. The diorama of the world is filled with details that make it worth leaning in to the environment to look around. Where a screen would just focus on your character in the center, you are free to look in different directions, finding different angles and exploring what would otherwise be unexplorable. In this demo, that didn’t have any real gameplay ramifications, and it likely won’t hugely impact the final game either, being that it is compatible with non-VR screens. Yet I would still prefer to play it in VR. Instead of feeling like I am the main character, I feel more like a helper and a guide looking out for her well being. It puts a whole different spin on the same experience. Though I may be gazing down like a god, this giant robot provides an enormous sense of scale. Much of Star Child still remains shrouded in mystery. This demo is the same one they’ve been showing for a while now. It’s an impressive demonstration of one of the many capabilities of virtual reality, and makes me eager to get my hands on the full game when it comes out next year. 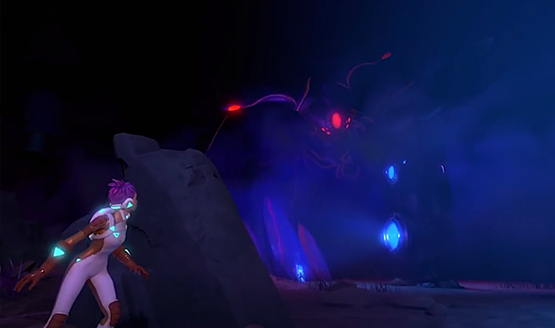 Star Child preview conducted at PlayStation Experience 2017.